Walker originally hails from Yonkers, N.Y. His family relocated to South Carolina when he was in high school and he was a two-year starter for coach Travis Garrett at USC-Salkehatchie. 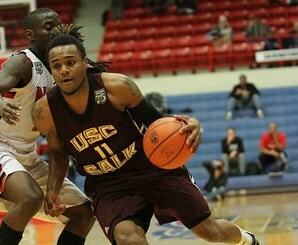 In Walker’s sophomore campaign he lead his team to “Hutch”, the National Junior College Athletics Association (NJCAA) tournament in Hutchinson, Kan. Only the top 32 teams in the nation in NJCAA make the national tournament, and Walker was second in rebounding for USC-Salkehatchie at 7.6 rebounds per game. TU coach Stephen Cox said Walker will fille a real need for the Night Hawks, who are entering their first season since restarting the program. TU last played basketball in 2001. “Fare’al added a much needed knack to get the basketball,” Cox said. “We needed a guy that rebounds the basketball well and he has proven that. We feel Fare’al can fill that gap of need in our roster. The Night Hawks open their season Oct. 27 against Devry University.